Price - 60JPY = $0.53USD with combo purchase. 330JPY = $2.93USD ala carte. Even though I still have a few reviews from Singapore, Korea and Macau in the queue, I felt the need to post this review ahead of the rest simply because so many readers have asked about it! 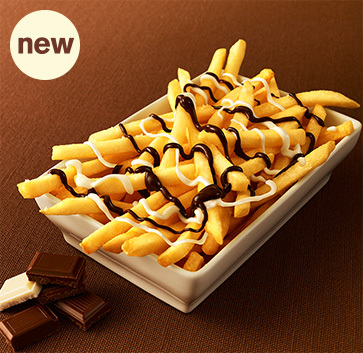 About two weeks ago McDonald's Japan quietly released the McChocolate Potato as an extra side add-on which you could purchase with any combo. McDonald's Japan runs a few different flavoured shakers each year in a similar fashion, and this isn't even the first time they've had a squeezable topping for their fries (although both earlier attempts in 2014 were the slightly more normal Cheese flavours). This time around they went with something completely new, and to most western palates, extremely weird - Chocolate. Just to give a bit of background before I dive into the review, the idea behind chocoalte and fries isn't that new in Japan. Many potato chip companies (as well as Chocolate companies I might add) sell a chocolate drizzed, dipped or even coated version of their chips. I remember trying Royce chocolate Calbee chips in Japan for the first time at least 5 years ago, and as long as the chocolate is of a decent quality, the fried+sweet combination does work surprisingly well. Don't get me wrong, these they don't taste anything like the awful chocolate flavoured Pringles limited edition that the US gets in the Christmas season, those are terrible, these are not. This isn't a chocolate shaker. This isn't chocolate flavour. This is chocolate. This is good. The fries are a standard medium fry served in a rectangular box (with a plastic fork so you don't get too messy) which you then drizzle your chocolate sauce directly onto the fries. The Chocolate sauce was served in the exact same packaging as the cheese, and all you need to do is bend it backwards and the sauce starts to pour out. McDonald's Japan has actually provided both a dark chocolate as well as a white chocolate, and each half of the package contained one type. If you weren't a fan if either chocolate, you are a bit out of luck, as aside from cutting the pack open manually, there's no real way to select either side if you go the instructed fold-and-pour route. The Wife, as expected, had the honour to do the pour. She, like many people I would imagine, went in with a completely closed mind and immediately thought that Chocolate and Chips could never work, and despite giving them a brief try, instantly shunned them away. I on the other hand made sure to give all 3 types of fries a try, one that was covered with both dark and white, one that was only hit with the dark chocolate, and another that only had white. My first fry was one that had a near full coating of both sauces. After the initial fear of "is this going to be terrible?" the flavours hit me one at a time, the first was the dark chocolate, which as expected was a bit on the milky side, and wasn't at all bitter. Then you taste the traditional fry flavours including the salt, which is a big factor at play here. The last flavour you get is the white chocolate. The white chocolate was probably the biggest let-down here as it didn't really taste that much like white chocolate, it was still creamy, it just didn't have the bite that white chocolate is supposed to have. I checked out the McDonald's website and the chocolate countries of origin were Ivory Coast, Indonesia and Malaysia respectively. Malaysia has a tendency to include palm oil in their chocolate and is usually at the cheaper and lower end of the chocolate quality scale, so I wouldn't be surprised if the white chocolate was Malaysia's addition to this meal. The dark chocolate was clearly the better of the two, and I ended up preferring it, and the fries that it was more heavily coating over the other. Although it was still milk chocolate and not true dark chocolate, you could still taste the cocoa, and it was a very respectable combination with both the salt, and the fat from the fries. Just as a I remember from my Chocolate+Potato Chips combinations the salt is a strangely important ingredient here. If the fry wasn't salty enough, the chocolate sauce overpowered the fry and tasted too sweet. When there was just the right amount of salt, there was a decent play between the sweet, salt, and fat content of the fry. Thanks for the review. I was interested to read about the release of this in news media. Now, I'm just wondering what are the ingredients of the chocolate sauce! I've recently started to keep eye on food, as researching book on 'business of palm oil boom'. Fascinated with your blog! Wonderful. fries in chocolate are always good ! !